Taiwanese idol group Fahrenheit performed in Hong Kong where Calvin invited one of his female friends to attend. She then became his "Secret Girlfriend". Since this news it has been revealed that a Hong Kong fan wanted to commit suicide. Yesterday at the "Love Fahrenheit More and More" event, Calvin said over and over again that this girl is not his girlfriend. Wu Zun also does not condone such actions (the suicide news). Calvin said: "I heard about this, but I don't know if it is true or not. I have told fans in the newspaper and online. In fact, what is funny is the fact that they said that that friend was Malaysian, she isn't la!" 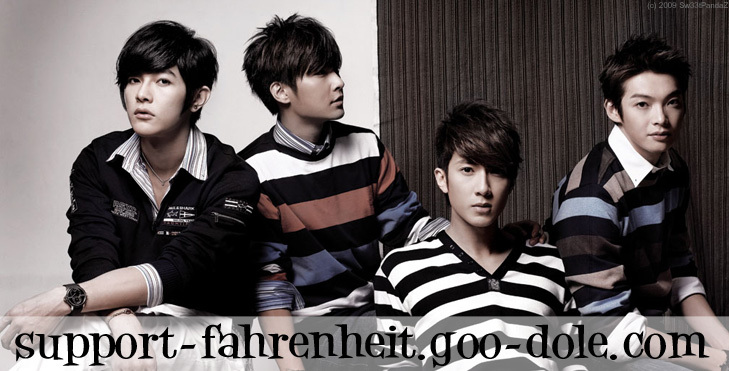 Wu Zun believes that Fahrenheit's fans have grown up with them over the past three years and should also be affected by their injuries and understand the importance of this. He said: "This is bad behaviour." Arron's new idol drama "Tao Hua Mei Mei" has been filming for almost a year. The male lead, Arron, will be replaced by Billie's son Nick. The best part of making the drama will become void. Arron seriously answered: "I went to confirm this matter with my company. They seriously reprimanded the statement. Now I have two dramas to consider. The company has also done its best to help with our arrangements in accepting roles. It's possible that some people hear false reports then write an article based on such a loose title. Actually we all know who this Nick is. I can only say that this news is false." WHAT!!! Arron will be replaced in Tao Hua Mei Mei????????????????????????? That. Is. Wrong. So wrong!!! And suicide because your idol has a girlfriend?? That is so stupid. i actually feel sorry for the girl's mom. mmm.. me too!! i mean how obsessed can u get? i think she may be suffering from depressionor sumthing.. ot be that devoted to a guy u probaby havnt even met.. sheesh.. creepy..
or maybe she just wants to get attention to herself..
hrmmm,, maybe.. but i gotta say.. she must be really troubled to want attnetion that way.. man.. celebrities have so much pressure.. damn crazy fans..
but celebrities get SO much money!! so i guess they dont mind..
hrmm.. that's tru.. well.. except it seems that jiro doesn't get paid much cuz he's still really in debt.. u'd kinda think that after these past few years.. he's just worked so much..